A gap is a break on a price chart where no trading happened. This indicates a sharp move up or down if it happens while the market is open. If this happens overnight when the market is closed then it is the result of other market price changes that influence this market. The most common definition for a gap is the area between the close of one price bar (or candlestick) and the open of the subsequent one. However, some traders refer to gaps as the area between the previous session's high or low and the subsequent session's open price. On this site we use the term extreme gap for this type of gap. In the stock market gaps will happen when an unexpected earnings announcement is made after the market closes. The opening price will reflect the new (unexpected) information and cause the stock to gap-up or gap-down. Even though some markets trade almost continuously (such as the E-mini S&P500 shown in the chart above) traders will look at the RTH session to determine if a gap exists or not. The RTH session mirrors the time that the S&P500 pit contract is traded. The chart above shows that the market gapped-down and remained trading down all day. One of the primary strategies for traders that look at the gap trade is to fade the gap. If you want to know more about fading the gap you can looking at the Gap Fade Study. 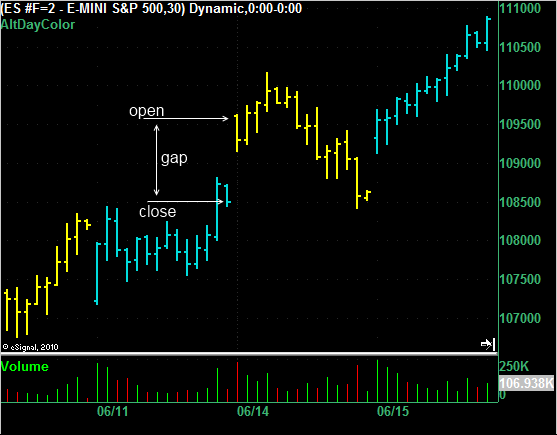 This chart also shows a gap in the E-mini S&P500 (ES) but in this case the gap closes during the trading day. Traders who faded-the-gap (i.e. traded for a gap close) would have made money. 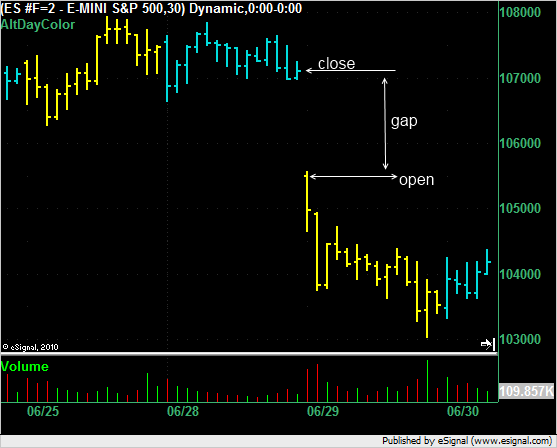 The Gap Fade Study shows that it is more likely for a gap to close than for a gap not to close.